While it is normally a bilious thing to watch the politicians of an officially secular state debate policy in terms of religion, it is at times so pathetically misguided as to be laughable—especially when the dictums of an ancient Israeli war god are invoked to determine what to do about impoverished illegal immigrants from Mexico. Nevertheless, evangelical Christian doctrine and morality once again insinuated its way into U.S. politics Wednesday when members of a House Judiciary subcommittee cited various passages from the Bible during a debate on immigration reform. For most of those present, the question was not whether the bible should be used to debate immigration reform, but rather how. The number of Congress members who belong to religious councils and conventions is quite gobsmacking—it is almost as though membership in such organizations is a prerequisite to holding a seat in the House or Senate. Among those who attended the hearing were Richard Land, a leader of the Southern Baptist Convention; Bishop Gerald Kicanas, of the United States Conference of Catholic Bishops; James Edwards, Jr., a fellow at the Center for Immigration Studies; and Mathew Staver, dean of the Liberty University law school. The hearing revealed a giant, gaping philosophical chasm dividing politicians over Arizona’s controversial new law granting officials unprecedented authority in arresting individuals they suspect to be illegal immigrants. …the government of the United States of America is not, in any sense, founded on the Christian religion…. Smith is certain that, somehow, he aced this one. Some will ask, “but what about context?” Well, the treaty makes the overall argument that because the United States is not a Christian country, it has no grounds for conflict with Muslim nations. It does not somehow, in some way, suggest, “okay, we’re a little bit Christian” or “okay, maybe we really are pushing a secret Christian agenda”. 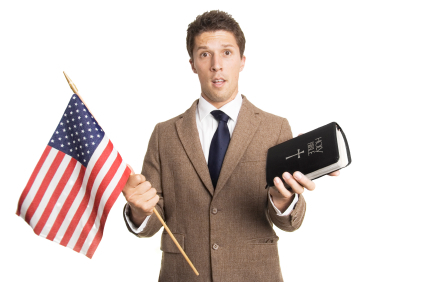 It says flat out that the United States is not founded on Christianity. It is hard to imagine John Adams participating in the sort of discussion the subcommittee held, at least from a bible-based perspective. seems to have fallen by the wayside. One might argue, “but they didn’t pass any law; they merely invoked the Bible”, yet if we understand the purpose of the clause to be the need to keep religion out of politics, then it does not exactly help to defer to “Church teaching” in a political discussion, does it? Still the evangelizing did not abate, nor did anybody seem to think twice about its appropriateness. Iowa GOP Representative Steve King chimed in with his own exegesis of the holy scripture, complaining how reform advocates saw the bible as excusing open borders: “I didn’t realize that the Bible barred the enforcement of immigration laws and neither did I realize that it erased borders, demanded pathways to citizenship for illegal immigrants, or … forbid the leaders of a nation from caring most about the well-being of its own citizens”. Further illustrating the biblical basis of his position, he then pointed out how Israel, the land of the bible, had recently constructed a fence to keep foreigners off its soil. The bible is not my book, nor Christianity my profession. I could never give assent to the long, complicated statements of Christian dogma. What is perhaps most disturbing about the religious nature of the hearing is the subjectivity with which religion was treated, and the fact that, apparently, it did not cross a single person’s mind that quoting bible passages at work might be a little bit unprofessional for lawmakers of a secular nation-state. Needless to say, separation of church and state is a principle ULC Monastery strongly supports, so the House Judiciary subcommittee’s hearing is more than slightly alarming. We invite our ministers to share their thoughts: Should Congress members be holding sermons and bible devotionals on the job? Check back often for updates on this and other issues concerning religion and politics.